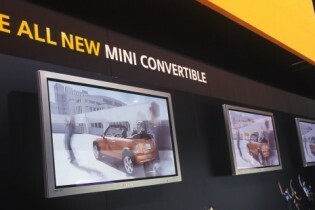 The launch of the MINI convertible at the NEC was a spectacular event conjured up by designer Nick Glazier, combining static car display, hospitality area and live driving arena. We supplied and installed over 60m of plain and printed scenic panels, along with 240 sq metres of mezzanine floor to create a spectacular 2 tier stand. 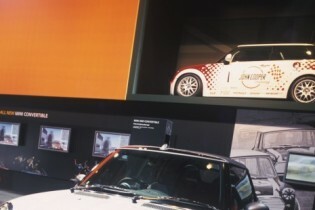 The upper level was fitted out with a bespoke bar and furniture to create a private lounge for MINI owners.